From the outside, a Kelly Klosure’s panelized steel building system looks and performs just like a conventional metal building system. 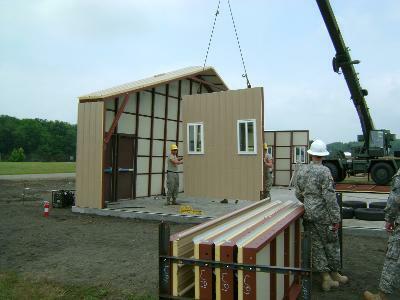 But the advantages of a panelized building for the end-user are many. In this series, we will highlight the differences between the Kelly Klosure panelized steel building vs conventional stick-built metal buildings. This article will focus on the speed of assembly. Kelly Klosure buildings arrive at the jobsite in factory assembled panels consisting of a 3’ wide structured steel channel/angle frame, optional insulation with steel interior liner and the ribbed exterior steel sheeting, all factory assembled! 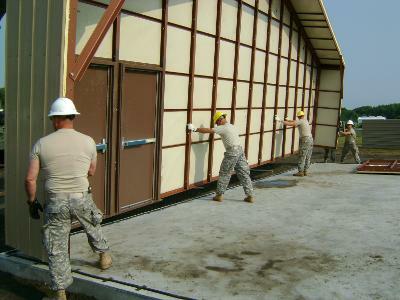 Personnel doors and windows, even framing for equipment doors are all factory installed! This contrasts stick-built construction that requires the sub-assembly of beams, columns , purlins and girts in the field, then draping the insulation over the purlins and girts and then you have to screw down the interior sheeting through the insulation! Oh and by the way, you’re not done yet! You still have to cut in and frame the personnel doors and windows! Not to mention attach the interior liner on the inside! Labor costs in the field is expensive. Kelly Klosure buildings can be installed as much as four (4) times faster than conventional stick-built construction saving big time money in on-site labor costs! Next Up: Savings in foundation costs!